Medicinal Chemistry Pharmaceutical Co., Ltd. (MCP), established in 2010 in Sapporo, Japan, is focused on developing innovative antibody drugs for controlling diseases using our specialized glycotechnology. MCP provides disease-specific formula of glycopeptides as high-quality seeds in drug discovery, supporting the creation of antibodies for cancer immunotherapy and the treatment of a wide variety of diseases. GlyPAL-EdAD™ is a unique ‘Seed Library’ for creating antibody drugs. The library is constructed from disease-specific glycopeptide antigens, which are rationally designed with our accumulated knowledge of glycomedicinal chemistry and are synthesized using our specialized glycotechnology. MUC-GlyPAL-EdAD™ is the mucin (MUC1～MUC22) glycopetide antigen library for antibody drugs in the fields of cancer immunotherapy, respiratory and gastrointestinal diseases. 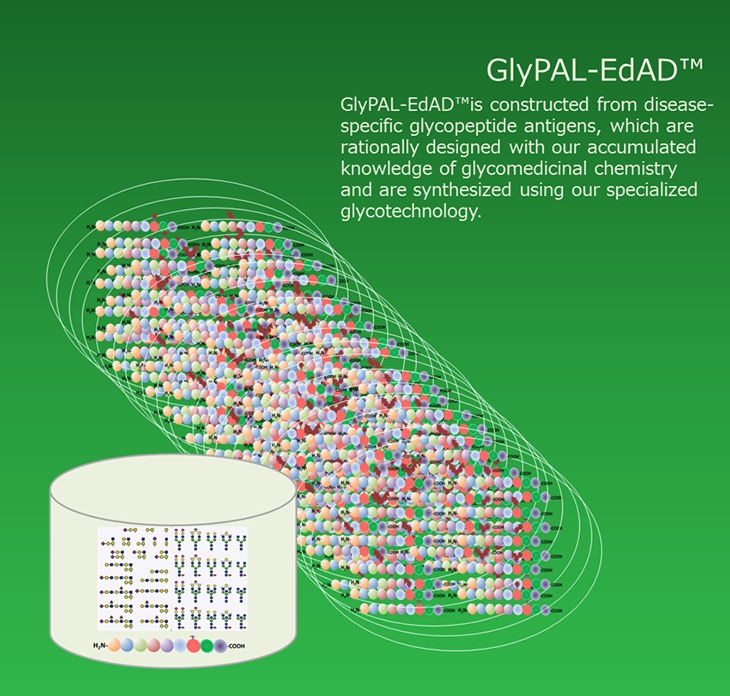 GPCR-GlyPAL-EdAD™ is our new seed library targeting druggable GPCR including orphan GPCR. Ed-antibody™ are defined as the antibody whose epitope is the specific structure of the synthetic glycopeptide used for immunization. 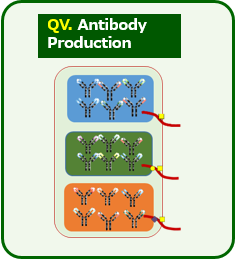 Ed-antibodies™ is prepared from GlyPAL™ using QuaDRAD™. MCP proposes a menu of contract/collaboration research with GlyPAL-EdAD™ and QuaDRAD™ to create next generation antibody drugs. 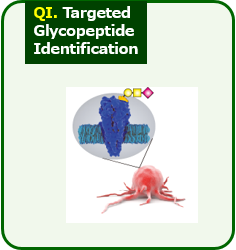 QuaDRAD™ is a high performance antibody drug discovery system, based on glyco-chemistry. The purpose of QuaDRAD™ is to be able to identify specific antibodies against diseases. The QuaDRAD™ system is basically divided into 6 stages, Q1-Q6. Stage one is the core of the system. 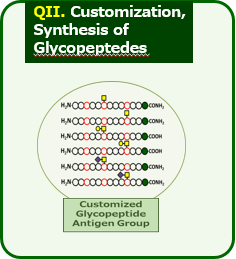 Rather than traditional methods of generating antibodies by using uncategorized antigens with complications or simple peptides, the disease-specific glycopeptide antigens are rationally designed with our accumulated knowledge of glyco-medicinal chemistry. with our accumulated knowledge of glycomedicinal chemistry. In stage two, the glycopeptides are synthesized using our experienced, specialized glycotechnology. 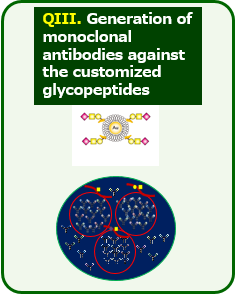 In Stage three, the glycopeptides to nanoparticles are attached and injected into a mouse to efficiently produce monoclonal antibodies against each customized glycopeptide. Stage four is the selection and matching stage. A synthesized group of the same glycopeptides injected into the mouse is attached to a microarray. Further to this, a wider range of synthetic glycopeptides are also included. Selected hybridoma from stage III are examined in the microarray assay. 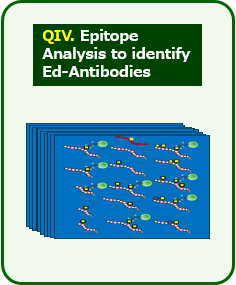 The specific Ed-antibody™ against each glycopeptide is then identified. In this stage, biochemical and biophysical properties of the antibodies are also characterized. In stage five, Ed-antibodoes™ are produced in groups in pilot scales to verify their pharmacological activities in animal models. 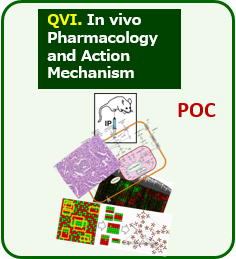 In " Proof of Concept " stage VI, the target antibody leads are selected, but also a lineup of back-up antibodies and other antibodies which fit to other indications and diagnostics are possible to obtained concurrently. QuaDRAD™ is thus a straightforward screening system from customized synthetic glycopeptide antigens to efficiently discover specific antibody drugs.